A Vacuum Truck Operator at Toledo Refinery received significant second degree burns while preparing to offload hot water to a sump. The employee was transported by Life Flight to a hospital for treatment.The investigation team was not able to interview the injured employee. OSHA opened a formal investigation related to the incident that remains on-going at the time of this report. Onyx Industrial Services provides routine vacuum truck and pressure washing services to the refinery. The vacuum tank is fitted with an intake (vacuum valve) and discharge valve. Valves are four-inch, 1/4 turn ball valves with four inch camlock tailpieces. The operator was using a three inch hose for vacuuming (filling the tank) and another three-inch hose at the discharge sump. The intake valve on this truck fitted with a four-to-three inch reducer on the tail-piece to allow connection of a three-inch hose with camlock coupling. After the incident, BP and Onyx inspected the vacuum truck. The vacuum truck was approximately ¾ full and the discharge valve was not leaking. The first person to arrive on-scene after the incident observed the discharge valve wide open, and a four-inch dust cap on the ground. The vacuum valve was closed, with the reducer, and dust cap installed. Manufacturer literature advises dust caps are not intended to contain hazardous materials or pressure.The injured had completed a Job Safety Analysis the day of the incident. He was wearing fire retardant clothing, safety glasses, hard hat, work boots and gloves. The injured either failed to notice the discharge valve was open during inspection, or opened the discharge valve before removing the four inch dust cap. The employee was positioned immediately behind the truck. As he removed the four-inch dust cap, he was exposed to the released contents of the vacuum truck. 1· Do you positively verify absence of thermal hazards before removing caps, plugs or valves from fixed andmobile equipment? 3· Is your equipment and that of your contactors designed to minimize the consequences of human error? 4· What PPE is required when transferring hot fluids? 5· How do you verify that contractors are conforming to their written HSE Plans (e.g equipment inspection, training, procedures, assesment)? During the start-up of the dehydration section of the DF2 plant, approximately 30tes of DIPE (Di-isopropylether) and 53tes of Acetic Acid were released in to the plant’s open channel trade effluent system from the base of steam stripper C205. This release began when C205 was started up with valve ‘A’ in the open position. This valve is normally closed during start-up and normal operation of the unit as referenced in the local procedures. With this valve open, C205 was gradually over-loaded with hydrocarbons and experienced high operating pressures. To maintain the start-up and prevent C205 tripping on high-pressure, the control temperature was deliberately kept low, leading to the loss of hydrocarbons from C205 base to effluent. Short duration pressure spikes had been experienced during start-ups on C205 in the past and the duty shift team felt that the column would recover (as previously) if left operating in this manner. Limited plant reviews took place to determine the cause of this sustained poor control. DIPE is used in this part of the process to break the Acetic Acid/water azeotrope. Normally, with valve ‘A’ closed, water (with residual hydrocarbons) flows from the base of liquid-liquid separator C213 to the E204 condensers before undergoing further separation in decanter D204. With valve ‘A’ open the system hydraulics allow back-flow of condensed hydrocarbons from the overheads of the Azeotrope column C204, directly in to C205. This was initially DIPE, but later became rich in Acetic Acid when the reflux back to C204 was lost. High TOC levels were first recorded by a local effluent on-line analyser at 19:55hrs on the 20th April and were further confirmed by spot sample effluent results (that were being taken every four hours) and continued until the unit was shutdown and isolated at 08:09hrs on the 21st April. Effluent had already been diverted to on-site storage before this event, so operating teams were confident there would be no breaches of consent. DIPE is a highly flammable immiscible hydrocarbon solvent with a low specific gravity, so readily floats on water. C205 base drops in to an open channel that passes through the plant before reaching the local effluent pit. 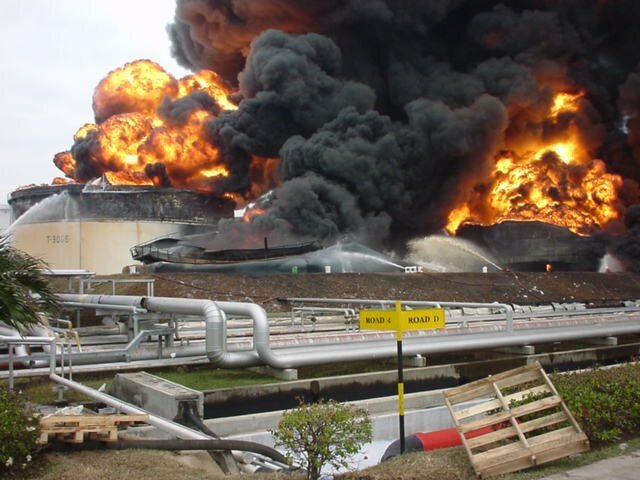 With such a large quantity of highly flammable material in an open channel, there was the potential for combustion with resulting escalation. · Engineering/Design. Valve ‘A’ should not have been open at start-up. The valve was not part of a locked closed valve register. Potential back-flow from E204 had not been recognised in any previous process safety studies. · Inattention/Lack of Awareness. Failure to adequately respond to high TOC levels from both on-line analysis and spot sample results and failure to appreciate volumes of hydrocarbons involved. Limited plant investigation took place. · Communication. Local Shift Site Manager (SSM) was not informed. Duty shift teams did not use local procedures for guidance on the actions to take on activation of high TOC alarm. · Poor judgement. Mistrust of local TOC analyser. Persistent operation of C205 at low temperatures to avoid high pressure spikes/trips, believing column control would recover naturally. · There were no breaches of consent, as effluent was already diverted to on-site storage as part of the plant re-start. · The DIPE was recovered in the DF2 local effluent system and removed for off-site disposal. · To immediately investigate and respond to any unexpected sustained rises in local effluent TOC results from on-line or spot sample analysis. · To improve communication between shift operating teams and the local SSM. · To actively investigate any abnormal effluent condition and seek further support as necessary. · Reinforce the expectation that operating teams shut the plant down rather than trying to recover from a persistent process upset condition. After carrying out re-bagging of a damaged PTA bag (1.1 tone) using two forklift trucks, one of the forklift trucks driver got out of the cab to remove the empty bag, as he was standing in front of his forklift and leaning forward to remove the empty bag from the forks of the truck, the second forklift truck (which was now transporting the full bag) made contact with him as the truck driving forward and turning to get out of the gate. This contact knocked the person on to the stationary forklift. The Injured person was sent to local hospital by the emergency response team and given a comprehensive medical check. He was discharged later that morning, suffering only localized bruising. The re-bagging operation should use the fixed hoist rather than using two Forklifts. The Injured Person stand at a very dangerous position but he did not pay much attention on it. The Forklift Driver just reverse the Forklift and drive forward, turn without noticing that the person is just in front of his Forklift. While using the overhead crane to move a barrel of lube oil, the screen from a fan shroud on one of the roof ventilation fans became dislodged possibly by the passing crane and fell approximately 40 ft. to the compressor deck below. The screen, measuring approx. 5 ft in diameter and weighing 40 lbs (see Photo #1 below) missed the person operating the crane by a distance of 15 to 20 ft. Fortunately; he was the only person in the Compressor Building at the time. A self-taping screw and tab holding the screen in place failed (possibly due to fatigue caused by vibration) allowing the screen to hang lower, and into the path of the overhead crane where it was caught and pulled loose. - The fan was immediately locked out and tagged to prevent further use until inspected. - An investigation was conducted and follow-up action promptly implemented. Inadequate technical design: The screens are held in place by only 4 small tabs welded to the screen material and secured to the fan shroud with self-taping screws. This design for securing the screens is evidently prone to failure, as other broken tabs and screws were also found on other fan screens. - A Management of Change was initiated and the remaining screens have been temporarily removed. Leonid Novokovski a 46 year employee of General Contractor Acis was blown off a 5 m (approximately) high canopy roof during construction of a new Service Station. Tragically, he died as a result of the fall. Leonid together with 2 fellow employees started to complete the roof by fixing the last row of sheet metal to a steel carcass. All 3 were wearing safety harnesses. Leonid removed his harness for reasons not yet known. A gust of wind blew the 4mx1m sheet and Leonid and his 2 co-workers off the roof. Leonid fell to the ground breaking his spinal chord in the region of his neck. His 2 co-workers, wearing safety harnesses, were uninjured. An ambulance was immediately summoned and arrived after 12 minutes. Leonid was pronounced dead by the ambulance doctor. The police arrived at 3 pm. 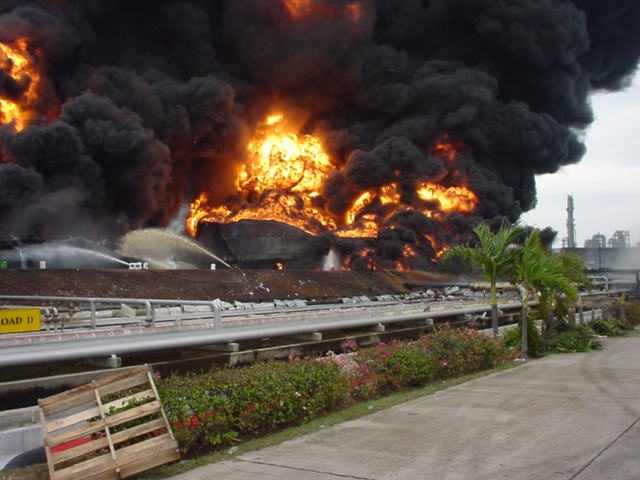 Experienced contractor management was on site at the time of the accident as was a permanently stationed BP representative. Acis informed the BP office of the incident at approximately 3 pm. An immediate attempt was made to contact the PUL and he was contacted within an hour. Within 3 hours the BUL, the GVP and R&M CEO’s Chief of staff had been briefed. An incident team was dispatched to the site and the contractor’s senior management was also summoned to the site. Work was halted on the site and another construction site. resumption of work will be preceded by a Safety Time Out. Leonid’s twin brother and nephew were working on the site. (The nephew was on the roof with Leonid.) They are in a state of shock and every effort is being made to address their emotional needs. Leonid had worked with Acis since 9/8/03. He had received full safety training. He was Ukrainian from the town of Ordgenikidze in Dniepropetrovsk region. 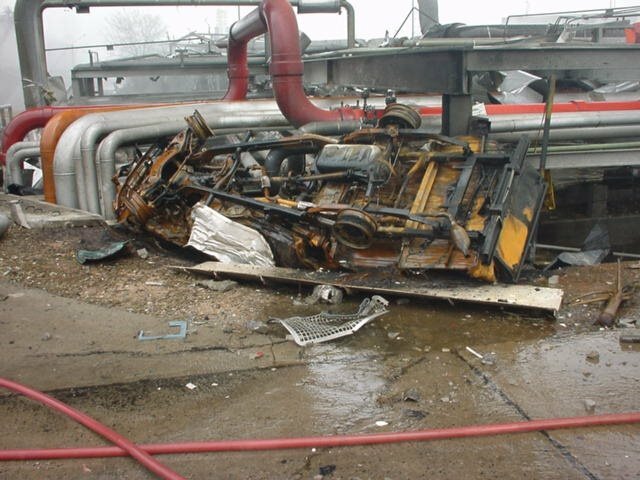 the reactor was vented for 10 minutes while full cooling At 8h00 pm , April 28, 2005 , an operational problem due to too a high polymer melt viscosity led to a an emergency shut-down of crystal line n° 2 in Wingles site. As per the emergency procedure, rarely used, was applied . The estimated vapor release is 1.3 t . Under weak windy conditions, styrene odors were detected by neighborhood community. Fire brigade has been called for enquiry. The odor disappeared within 30 minutes and the operations were successfully and safely stopped. The French Regulations Authorities have been informed. To date, no contact from the media. Environmental and health nuisances; damage to BP image . - Lack of judgment : The control room operator increased the contents of one reactor which led to the process upset. - No use of fire water gyromonitors which would have decreased partially the consequences of the vent via condensation of the vapors . - Inadequate safety devices No means to catch or condense the vapors during an emergency reactor vent . - Equipment - Other: The contents of the reactors were fairly high and possibly outside the operating window. - Inadequate Recall of Training Material: There was no evidence that the operator was aware of the consequences of increasing the contents of the reactor . - Inadequate correction of prior incident: a similar incident occurred in June 2001 .No adequate corrective action was taken. - Inadequate technical design: The design input was obsolete. - Procedures: - This critical factor refers to the operating window of the process. Potential situation not covered: the emergency procedure does not call for fire water use in case of venting . - Operators should be remembered / trained regarding the hazards of running the process close to the operating window. - Although venting of the reactor is part of the emergency procedure, the potential consequences were not sufficiently assessed. Adequate safety devices will be provided . · During reinstallation, the workers experienced problems to position the motor and had to manoeuvre it to enable reconnection. · The motor fell down on the leg of one of the workers.A second worker jumped away and experienced a slight cut. · Medical treatment and follow-up. 1· Lifting training is needed that covers how to deal with sharp edges. 2· Evaluate who should be trained to do (manual) lifting works. 3· Improve warehouse storage process to have sufficient approved safety material available. 4· Evaluate what ideas can be copied from TAR’s during a smaller stop (eg container with safety material in unit). 5· Evaluate need for a plant-wide procedure/checklist for doing (manual) lifting works. 6· Evaluate what ideas can be copied from TAR’s during a smaller stop (eg container with safety material in unit). 7· Evaluate need for a plant-wide procedure/checklist for doing (manual) lifting works. One of the gasoline tanks was overflowed. A security guard detected a strong smell and notified shift control who sent two operators to investigate. They don’t walk but they drive. Say no more, the bang was so big and shock the apartment building in Pattaya about 20kms away. The fire spread from one tank to 4 others before it was contained and eventually put out by allowing the fuel to completely burn out, over 100,000 litres. There was 8 fatalities and 13 hospitalized with serious injuries. Fortunately it had occurred during silence hours and save over 100 people as admin building, maintenance workshop store and medical center were either completely gutted or severely damaged by the blast.